Without the benefit of a Farmer's Almanac or sophisticated meteorological computer modeling, it is clear that it will be a long, cold winter in Philadelphia. The San Francisco Giants ensured as much when they defeated the Phillies last night to wrest away the National League Pennant that had been in their possession for two years. Regrettably, the Phillies also helped to ensure that with their own continuing inability to generate runs in the postseason. Last season's playoff hitting star Ryan Howard stood frozen, unable to pull the trigger on a Brian Wilson 3-2 cutter that barely touched the bottom edge of the strike zone. After a pregnant pause that suspended an entire fanbase, home plate umpire Tom Hallion rung up Howard to end the Phillies two year NL reign. The strikeout that left two runners stranded will be replayed for generations to come. It also aptly symbolizes the Phillies disappointing 2010 postseason performance. Despite having a high profile and seemingly high power offense, the Phillies simply could not push runs across the plate. They could not come through with big hits or even score runners from third when all they needed to do was put a ball in play. The night started with great promise as the team seemed to finally find their missing mojo. Chase Utley's ringing double into the right field corner and Jayson Werth's warning track sacrifice fly staked them to a 2-0 lead in the first. Then, it was radio silence the rest of the way. 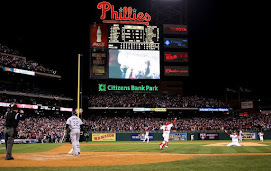 The Phillies reverted back to 2010 form, unable to push another run across the dish with the entire season on the line. The first inning evoked deja vu that hearkened back to the 2008 and 2009 championship teams. It appeared as if the bats had broken out of their slumber and the Phillies were primed to play to expectations. The 2010 postseason reality quickly kicked back in, however, when a "shoulda-woulda-coulda" top half of the third allowed the Giants to even the score. Utley whiffed on grounder that appeared within his reach, Victorino couldn't quite hang on to make a Willie Mays replica catch, and Polanco threw away a swinging bunt. Next, a promising bottom half of the inning started with a walk and yet another hit batter. After Utley flipped the ball back to the mound when it caromed back after drilling him just below the neck, Giants starter Jonathan Sanchez went ballistic. Isn't the batter who took the heater in the spine the one entitled to be annoyed? Sanchez's actions touched off a bench clearing scrum that allowed valuable time for Jeremy Affeldt to get loose in the pen. After the field cleared, Bruce Bochy replaced the rattled Sanchez with Affeldt, who promptly extinguished the rally. Giants hurlers worked into trouble over the balance of the game, but Phillies hitters could never cash in. The Phillies appeared that they were going to breakthrough with two outs in the fifth when Howard lined a double to left center with Rollins on first. Third base coach Sam Polazzo somewhat shockingly held Rollins on what would have been a close play, but one in which the speedy shortstop typically crosses the plate with the certainty of death and taxes. In the sixth, the Phils were knocking on the door again when Ibanez doubled to left to start the frame and was moved over by a Ruiz bunt. After working a 2-0 count, pinch hitter Ben Francisco missed a couple hittable pitches before taking a called third strike. The looping curve ball appeared to be high and wide, but as Howard learned later, swinging at anything close was an advisable approach with two strikes. After both teams took turns leaving men on base for a long stretch, Juan Uribe jumped on Ryan Madson's first pitch fastball with two outs in the eighth and lofted a high fly ball to right that had just enough carry to reach the seats. The Citizens Bank Park crowd was suddenly silenced as the Giants took a 3-2 lead. Bochy called on Thursday's losing pitcher Tim Lincecum. After surrendering singles to Victorino and Ibanez with one out, his night was done. Wilson trotted in with his crazed closer act and got extremely lucky when Carlos Ruiz lined into a double play. Brad Lidge loaded the bases in the ninth, but got Wilson to bounce out to maintain the one run deficit. The stage was set for one last ditch effort to rally to keep the Phillies season alive. With one out, Rollins walked, but was erased on Polanco's fielder's choice. Utley worked another walk, putting the Phillies 2010 season into the hands of their cleanup hitter who had yet to record an RBI in either playoff series. Howard lingered in disbelief after being rung up, while Wilson celebrated himself with his signature ritual. Giants players rushed to the center of the field to celebrate their large upset and a trip to the "Fall Classic." The winningest team in baseball, the odds-on favorite, and the Phillies' most talented team ever had fallen short of its goal and expectations. A season so full of promise was prematurely over. A marvelously talented and highly appealing team was exiting the big stage before the final act. 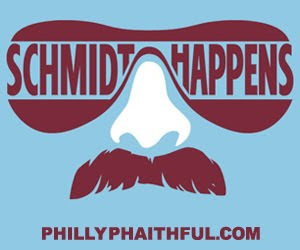 All that remains is a cruel winter of wondering what went wrong and what could have been for the Phillies players, coaches, front office, and fans.